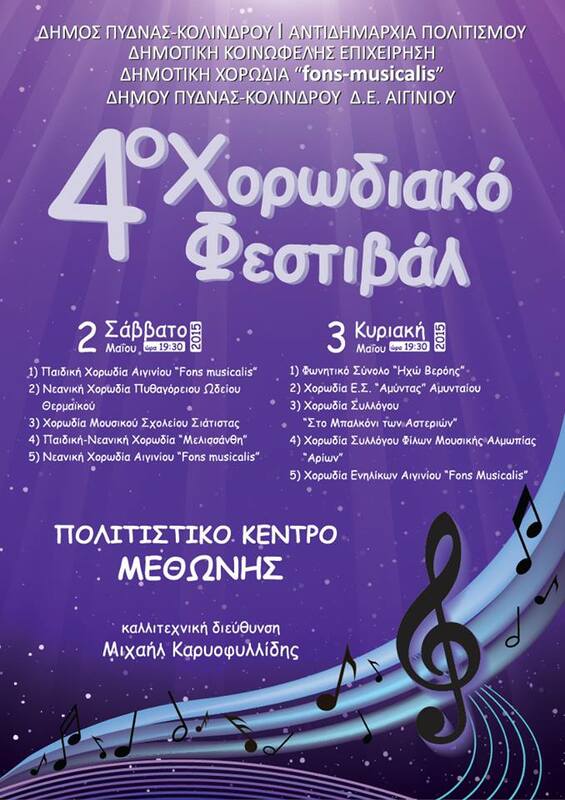 This Saturday, 2nd May 2015, Melissanthi and other youth and children’s choir welcome you at the Methoni Cultural Center at 19:30 for the 4th Choir Festival of Pydna-Kolindros. Aparth from Melissanthi, will also sing on the festival stage the Youth Choir of Pythagorio Concervatory of Thermaikos, the Siatista Music Scholl Choir and of course the hosts with the Youth and the Children’s Choir of Aiginio “Fons Musicalis“. The festival is organized by the Cultural Department, the Common Good Company and the choir “Fons Musicalis” of Pydna-Kolidros Municipality. The festival’s art director is Michael Karyofyllidis. Melissanthi is conducted by Eleni Theodoridou. Kostas Pantelidis accompanies at the piano and of course Grigoris Savvopoulos puts his artistic sign. Tagged Eleni Theodoridou, Festival, Grigoris Savvopoulos, Kostas Pantelidis, Melissanthi.